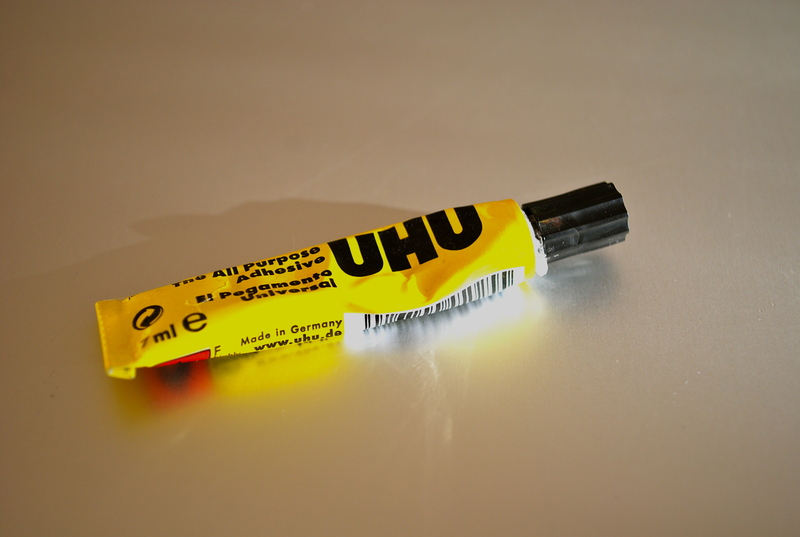 What is it about a tube of UHU that is just so appealing? Is it a nostalgic attraction? After all it has looked like this for decades. No, I believe it’s more than that. It has to do with colour selection. All colours have a “value” which refers to the lightness or darkness of a hue, in other words how much black or white they contain. A hue with no black or white is a pure hue. Red is a pure hue but if you add white you create pink which is a light value of red. However, pure hues all have different light values. Yellow happens to have the lightest value in the spectrum, in other words it is closest to white. Violet has the darkest value i.e it is furthest from white and closer to black. However, you can change the value of say violet by adding white thus creating lavender. Lavender has a light value which is opposite to it’s natural order so it is referred to as a “discord” colour. I seemed to have digressed….back to UHU. Pure yellow has been selected for the background (the lightest value hue), with the graphics in black (strong contrast to yellow). Research carried out by Walter Sargent and M.Luckiesch in the mid twentieth century discovered that the most legible combination of colours proved to be black graphics on a yellow background (black on white was only ranked fifth). So there we have it, a perfect colour combo for trusty old tube of UHU. Colour expert Edith Anderson Feisner expands on this topic in her book, “Colour, in Art & Design” – a great read. This entry was posted in colour and tagged linkedin, packaging, red, UHU, yellow. Bookmark the permalink.